Who realises that a modern industrial site just outside of Mepal hides so much history dating from the Second World War and that Mepal, Sutton and Witcham were in the front line of the Cold War and would have been a major Soviet target? “The rockets will be the property of Her Majesty’s Government, manned by British troops who will receive their prior training from American experts. The rockets cannot be fired by any except the British personnel, but the warhead will be in the control of the United States – which is the law of the United States- and to that extent the Americans have negative control; but it is absolutely untrue to say that the President and not the British Government will decide when these missiles will be launched and at whom. So long as we rely upon the American warheads, and only so long, that will remain a matter for the two Governments”. 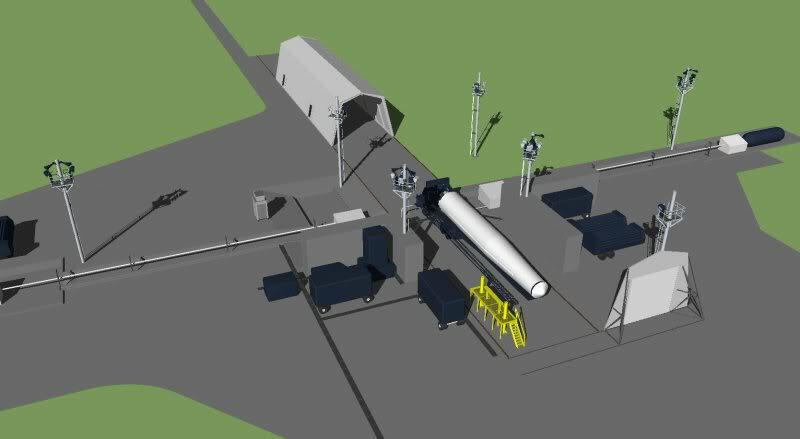 Project Emily was then born and twenty sites were chosen to house the new missiles. 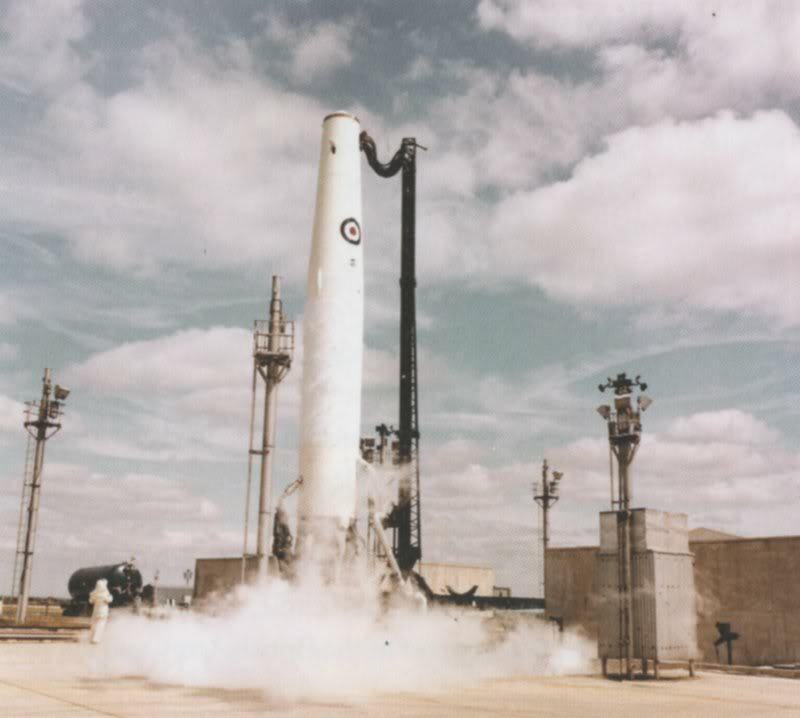 Construction started at Mepal in 1958 and was declared operational on 22nd July 1959 with the reformed 113 (SM) Squadron; the SM stands for ‘Strategic Missile’. Each site had three Thor missile pads and was part of a cluster of five sites under the command of one base. 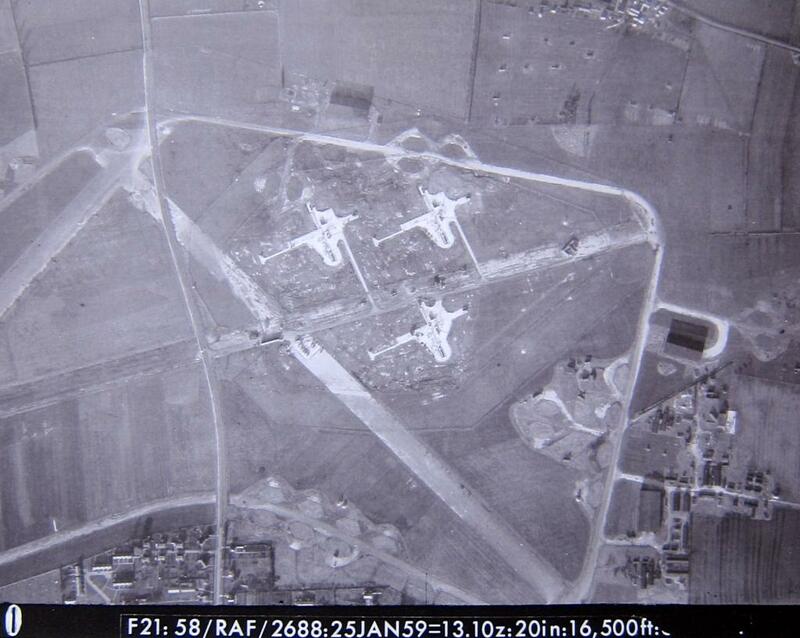 Feltwell was the first base to be operational in 9th January 1959 and Mepal was under its command. 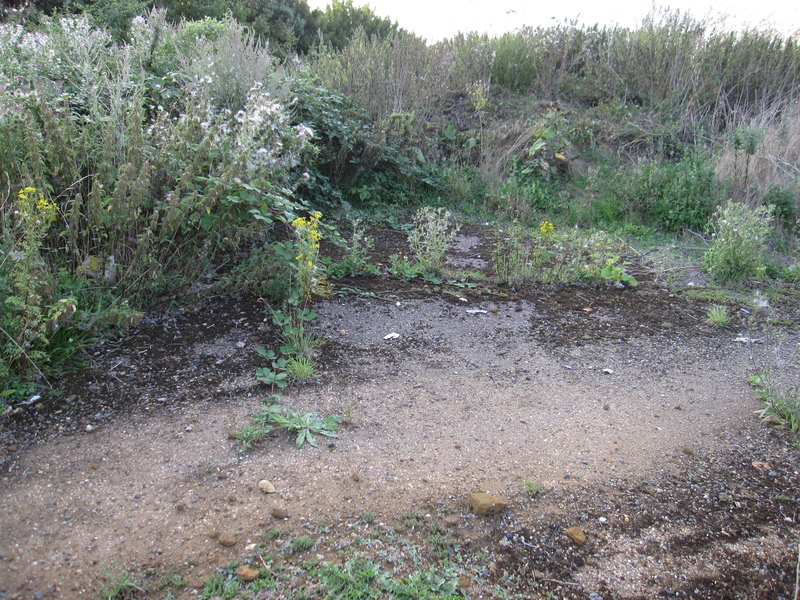 The missiles themselves were kept prone and invisible in specially made shelters such as the one in the picture below. Thor missile shelter clearly shown. Courtesy of Paul Bellamy at Airfield Information Exchange. When the order came to launch, whether real or simulated, it would take up to 15 minutes to get the missile ready and the sequence needed the authority of both the British and Americans. The ‘dual key’ system meant that the RAF could initiate a countdown but the missile could only be launched after the Americans had armed the warhead. In fact the warheads (1.44 Megatons) were not even kept on site but at Faldingworth, an old wartime airfield near Scampton, Lincolnshire. 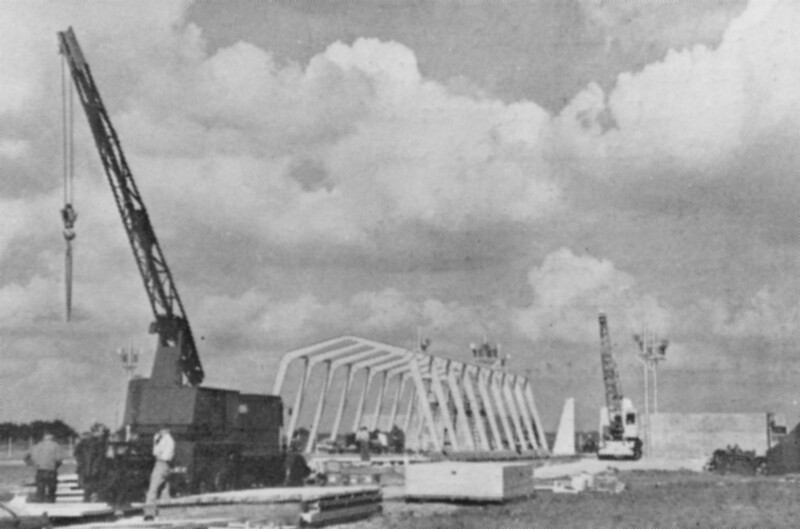 Construction of the Thor missile hangar. Photo courtesy of the Carpetbagger Aviation Museum, Harrington. 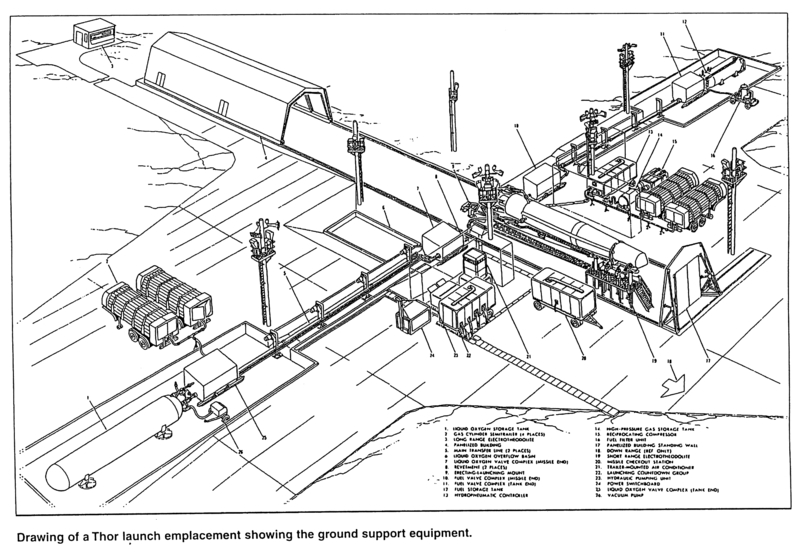 The layout of a Thor launch pad. Photo courtesy of the Carpetbagger Aviation Museum, Harrington. The missiles were only put on a high state of readiness once in their history and that was during the Cuban Missile Crisis of October 1962. Thor missile in its launch position. Courtesy of Paul Bellamy at Airfield Information Exchange. Valiant, Victor and Vulcan bombers. There is very little evidence left of both the WW2 and Cold War heritage of Mepal airfield but if you know where to look there are some interesting relics. Part of the runways and perimeter track are still visible on the Sutton side of the A142, while the Elean Business Park and the straw burning power station cover much of the Eastern side but some elements can still be seen. In fact many of the buildings and access roads to the domestic site can be seen around Witcham and the sewage works built for the airfield is still in use today! Martyn Chorlton’s excellent book Airfield focus 47: Mepal and Witchford has many interesting photos and maps. I took this photo on the old Sutton to Mepal road, it is actually part of the North West to South East runway! The Thor missile bases where broken up before the power station was built but part of the southern base (LE10) can still be seen at the north-eastern edge of the Cheffins Auction site. 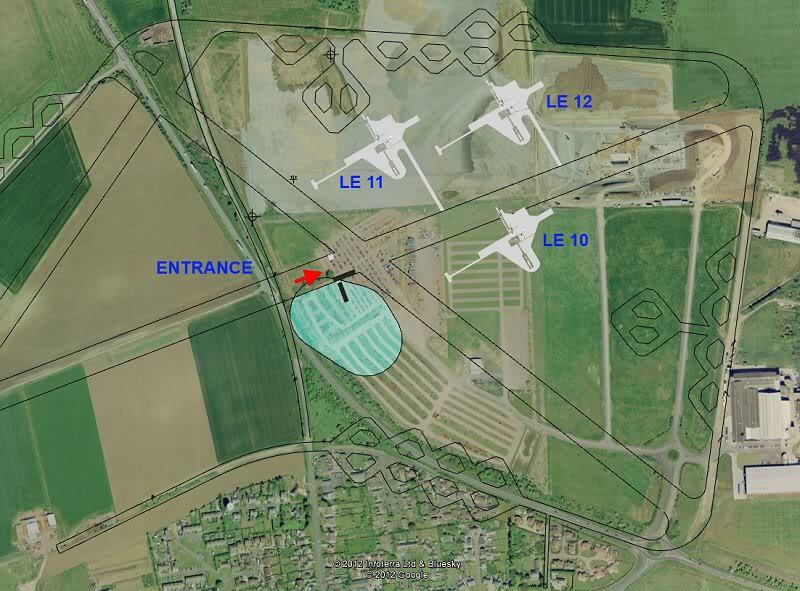 An overlay of the missile bases and runways on a recent aerial photo. Courtesy of Paul Bellamy at the Airfield Information Exchange. station when it was built. 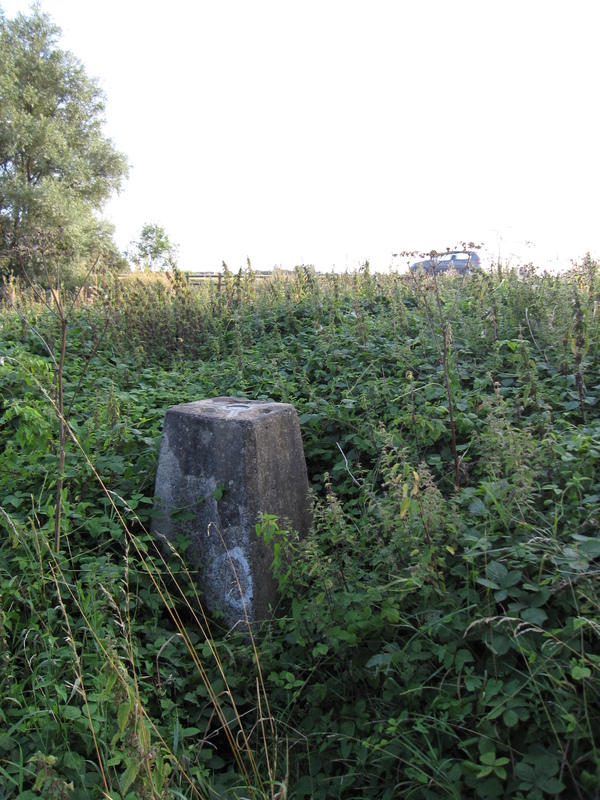 Mepal South, Project Emily Trig Point. I’m sure many people have memories or stories to tell of the history of Mepal airfield, we would be delighted to hear from you and will update the Blog with any new information. We aim to carry out a dedicated project on the history of the airfield over the next few years, watch this space for more details. I would like to thank the Airfield Information Exchange and the Carpetbagger Aviation Museum for helping out with pictures and information. This entry was posted in Heritage, History, Stage 2-Development Phase, Theme 2-Hidden Heritage, Theme 3-Fen Folk & Legends and tagged Cold War, Harold Macmillan, Intermediate-range ballistic missile, Mepal, PGM-17 Thor, Project Emily, Sutton, Trig point, Witcham by peteratousewasheslps. Bookmark the permalink.